I would like to say Thank You to all of you, whose very excited and happy about my new domain name. Your comments were undeniable inspiring to me and truly appreciate it! After I replied to all your comments this morning and going through my previous post. I accidentally deleted my blogpost about (Undergo a Little Change on Both blogs) I know! It's extremely frustrating! :( I tried everything I could but I just couldn't bring it back. 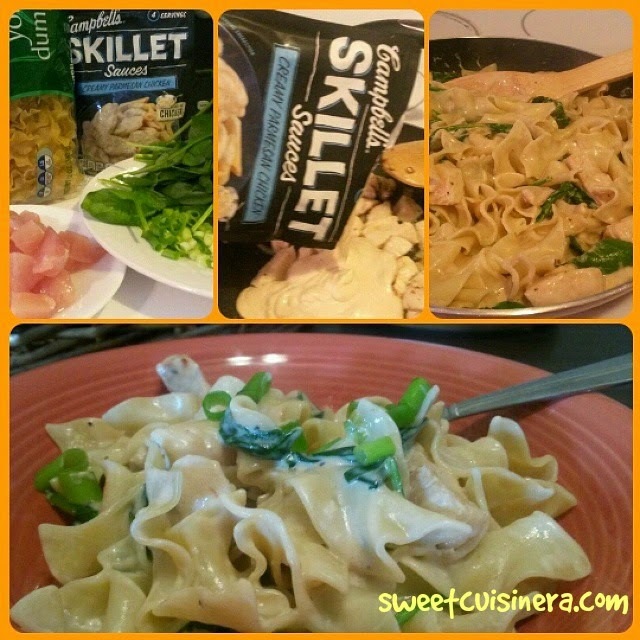 My apology to all who commented on that blogpost..
Anyways- I have an exciting and fun recipes that I like to share with you all featuring the Campbell's Tasters courtesy from Campbell's and Crowdtap. Yippee! As a foodie lover this Sample and Share is amazing! I have different kind of recipe helpers that will help me to create a delicious dish without spending too much time in the kitchen. Also Campbell's provide recipe ideas that can be found on the back of each products..Awesome!! How to join Crowdtap? Just head over to their website www.crowdtap.com and register for FREE! That's it! Just start exploring the site and let's have fun together tappin'! :) I forgot to mention that its mobile friendly which is so great! you can tap anytime you want! wohoo!! So generous right? I think so too- :) I received all those product mentioned above plus a coupon booklet that includes a FREE New V8 juice and $1.00 of coupons on every product, which I shared with my family and friends. I know the title of this recipe is kinda long-:) I just can't think of anything that will put them all together. Here we go! - In large skillet, brown the cut chicken. Once the Chicken is cooked, add the Campbell's Skillet Sauce. Let it simmer for couple minutes. Add the spinach and turn off the heat. - At this point you either add the cooked egg-noodles to the creamy chicken or you can put the creamy chicken with spinach over the noodles. Either way they are equally delicious. This is the recipe I come up with using Prego Homestyle Alfredo Sauce: Totally homemade and I add my personal twist on the dish by adding sausage. Yum! - Cooked the sausage on the skillet until golden brown. Add the Prego Light Homestyle Alfredo Sauce. Let it simmer, then add the spaghetti noodles. Mix it together until everything is combine. Served HOT along with garlic bread. - The sausage is totally optional. 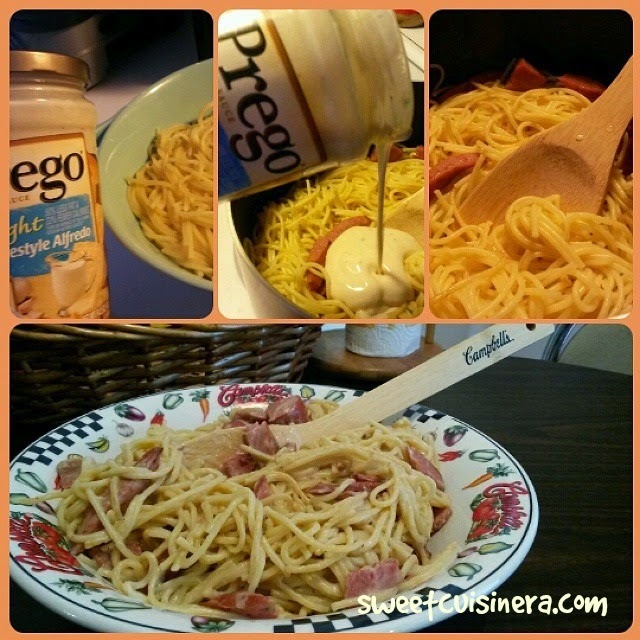 Just be creative with your Prego Sauce and I'm sure its delicious and always impress everyone's taste. After creating few delicious dish using Campbell's Tasters. I think we need a refreshing drink right? * I pour 1/2 cup V8 Spicy Mango and 1/2 Pineapple juice in the Shaker. Add some ice cubes and shake it to perfections. That's it! - You can totally make it fancy by dipping the tip of your glass with salt then add your V8 juice mix. Adjust the serving size and taste according to your preference. It is delicious! 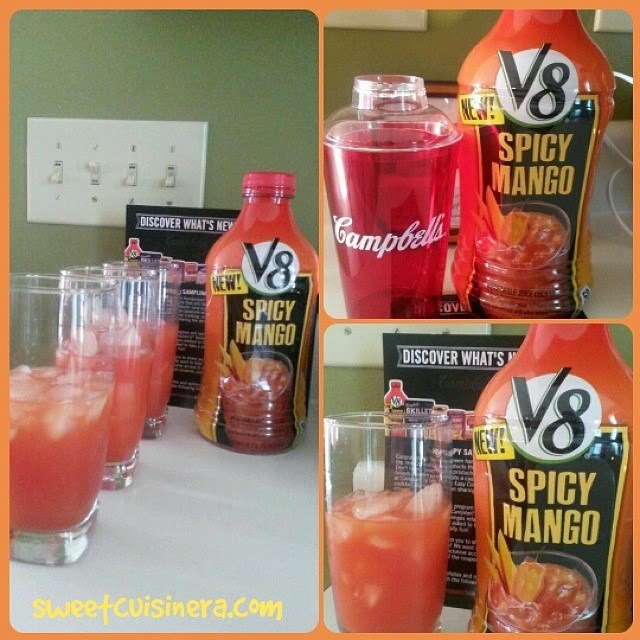 I like mine with more pineaaple juice--- and my friends love the NEW V8 Spicy Mango! CHEERS! Those are just few of the recipes that I made using Campbell's Tasters Sample and Share. They have plenty of products need to be explore and I cannot simply wait. A perfect helper for holiday entertaining and easy meal ideas. 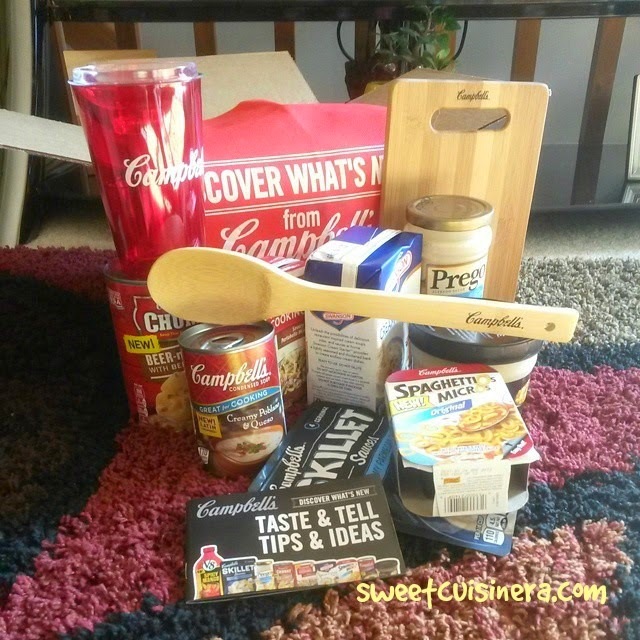 Grab your Campbell's product and let's start cooking! I hope this recipe inspire you this holiday season. If you need more recipe ideas using Campbell's Product just check their FB Page or simply visit their website- for TONS great recipe ideas!!. Let me know what you think about Campbell's product in general! Leave me a comment below! and I'll promise I'll be careful this time going through my blog post! Enjoy the rest of the week everyone! See you in few days---:) Stay warm and be inspired always!!! I didnt know preg ohas white sauce. Wow, how I wish there is crowdtap here. Such a lovely site! It makes me so hungry! Egg noodles and chicken super combo! Wanna eat nowww! This page makes me hungry. I always want to try the V8 juice, but I don't know where to find them. Very yummy dishes. Congratulations on your new domain by the way! The company is truly generous! The giveaway will certainly enable you to create more delectable dishes your family will enjoy. This is also a good way to save on some cash, right? I also love pasta with white sauce, kahit pasta lang okay na ako for dinner. Thanks for sharing your own version of pasta with white sauce, it looks yummy! Ooh.. I love preggo sauces for pasta. My kids love eating it for dinner. I love campbells, it is always in my grocery list. I wish we have crowdtap here. I think you no longer go to the grocery. Everything is already delivered in your doorstep! You lucky girl. I also wish we have Crowdtap here. Spicy mango looks interesting. I can't imagine how it tastes like but I think that is a good party drink. They all look appetizing. :) It's merienda time now in the Phils. haha, it's very mouth-watering! Dili Sis woi, kapangalan lang.. nice pud noon kai dli nako maglisod spelling ba kai moingon nalng ko nga Campbell soup hahaha. Mao sad na ask sakong manghod. The Spicy Mango is really good paired with pineapple juice., refreshing ang a perfect party drink. :) Thanks!